Namiki Sôsuke's puppet drama "Hibariyama Himesute Matsu" was premiered in the 2nd lunar month of 1740 in Ôsaka at the Toyotakeza. The 3rd act, "Toyonari Yakata" ("At Toyonari Mansion"), was adapted for Kabuki in 1760 and staged in Ôsaka at the Tenma Tenjin (miyaji shibai). "Hibariyama Himesute Matsu" was revived 25 years later, from the 1st to the 3rd acts, in the 3rd lunar month of 1785 and staged in Ôsaka at the Kita no Shinchi Shibai (unknown casting). The third act was stage independently for the first time in the puppet theater in the 2nd lunar month of 1797 in Ôsaka at the Higashi no Shibai and performed under the title "Chûjô Hime Koseki no Matsu". During the Meiji period, Takeshiba Kinsaku I's drama "Chûjô Hime Taima Engi" was premiered in March 1884 in Tôkyô at the Harukiza [casting]. This version was quite faithful to "Chûjô Hime Koseki no Matsu" with minor changes like Iwane Gozen being named Teruhi-no-Mae. The heroine of this drama is Princess Chûjô, who is sometimes called the Japanese Cinderella. She escaped persecution at the hands of her stepmother (Iwane Gozen or Teruhi-no-Mae in the dramas) by becoming a nun at the Taima Temple in Nara. She has become a folk heroine, the subject of numerous Japanese folktales which celebrated her filial piety. The current version of "Chûjô Hime" is made up of one act (one scene), the yukizeme scene, which is also called "Toyonari Yakata" ("At Toyonari's Mansion"). Lady Iwane, the second wife of Yokohagi Toyonari, Minister of the Right, is plotting to overthrow the government in conspiracy with Fujiwara Hirotsugu and other wicked politicians. She hates Princess Chûjô, Toyonari's daughter by his first marriage, and falsely charges her with her improper relations with a servant. Her hatred of Princess Chûjô is further intensified when Princess Chûjô detected her in the act of stealing an image of the Goddess of Mercy cherished by her husband. To cover up her crime she falsely incriminates Princess Chûjô by entrusting the image to her for safekeeping and having it stolen by Lady Iwane's confidant. Lady Iwane and Hirotsugu charge Princess Chûjô with hiding the image and demand her confession. When Princess Chûjô pleads her innocence they take her into the garden in the snow and have servants beat her with bamboo poles. Kirinoya, a maid who has been expelled from the house by Lady Iwane because of her sympathy with Princess Chûjô, comes back but is not permitted to enter. She throws her coat into the garden from outside to protect Princess Chûjô from the snow. Lady Iwane comes to the garden and grabs Princess Chûjô's hair to pull her down. She is about to strike Princess Chûjô with a bamboo pole when Kirinoya breaks open the garden gate to come to her rescue. Surprised, Hirotsugu tells Ukifune, another maid, to expel Kirinoya. Ukifune confronts Kirinoya with a bamboo pole in her hand. When Princess Chûjô tries to interfere, Ukifune strikes her with the pole, causing her to fall unconscious. Lady Iwane and Hirotsugu hurry away, afraid of being held responsible for Princess Chûjô's possible death. Ukifune's blow was, however, far from fatal. In fact she, who was also sympathetic to Princess Chûjô, pretended to hit her hard and Princess Chûjô pretended to fall unconscious as had been secretly asked by Ukifune. 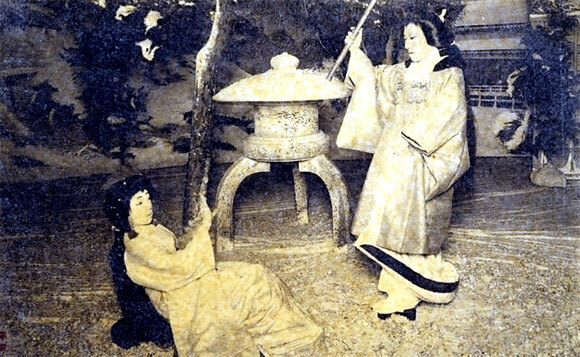 As Ukifune and Kirinoya help Princess Chûjô get to her feet Toyonari appears and, pretending that he believes Princess Chûjô has died, says to the maids apologetically that he has deliberately overlooked the torture of Princess Chûjô by Lady Iwane because if he exposed her crime she would certainly blame the retired Emperor and cause him to be exiled. Toyonari suggests to the maids to carry "Princess Chûjô's corpse" to Mount Hibari (Hibariyama) and bury it there. He secretly bids farewell to his daughter, wishing her to be well protected, staying away from her vicious and evil stepmother.